Manufacturing in New York state expanded in February for the first time in seven months, boosted by a surge in new orders, the New York Federal Reserve said in a report on Friday. The New York Fed's "Empire State" general business conditions index rose to 10.0 from -7.8 the month before, easily topping economists' forecast of -2.0. February's index showed the first growth in the sector since July and the best performance since May 2012. New orders surged to 13.31, the highest since May of 2011, from -7.2 in January. Inventories rose to 0.0 from -8.6. Employment gauges rebounded as well. The index for the number of employees rose to 8.1 from -4.3 for its best showing since August of 2012. The average employee workweek index edged up to -4.0 from -5.4. The prices paid index jumped to 26.3 from 22.6 in January. 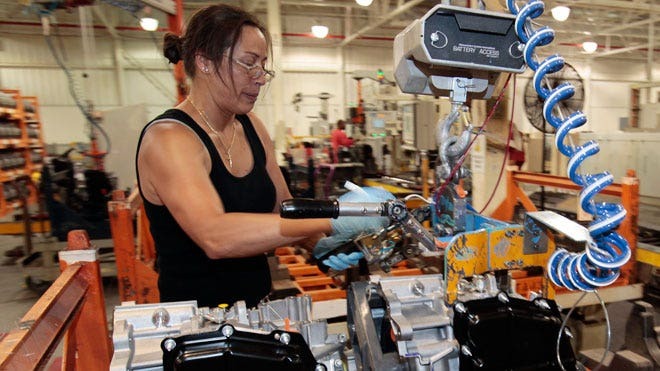 Manufacturers in the state were also more optimistic about the future, with the index of business conditions six months ahead rising to 33.1 in February, the highest in 10 months. The January reading was 22.4.